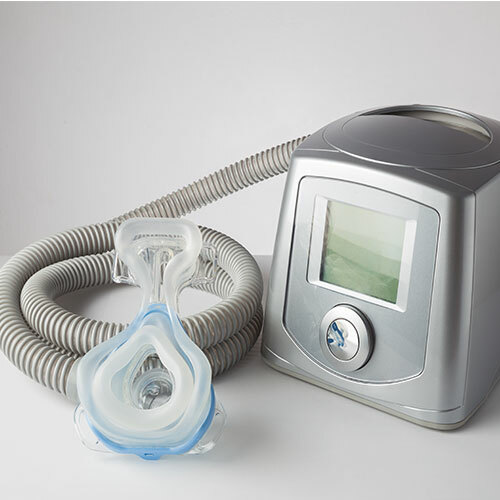 Many patients who suffer from respiratory complications require aids like oxygen concentrators and CPAP machines to help them breathe more easily. Often, these pieces of equipment are used all day or during the night and need to operate quietly so they do not disturb patients. A manufacturer of respiratory devices came to Polymer Technologies with a request for a solution. Their first requirement was to reduce the amount of noise produced by the machine during operation. They also requested that we reduce the amount of pieces needed to assemble the respirator and therefore the total manufacturing cost. Working closely with the manufacturer’s engineering department, we took all of their requirements into consideration and examined their current solution. Initially, the respirator manufacturer used a flat foam solution that required about 37 different parts to assemble inside the device. We determined that a molded foam solution from our Polymer Molded Products Division (PMP) was ideal to meet the manufacturer's needs. Custom molded foam is an open cell foam material that can be formed into nearly any 3D shape and is ideal for sound attenuation, insulation, and thermal control. Taking the manufacturer’s specifications and initial foam solution in mind, we developed a custom solution that met their requirements. Reduced 37 different assembly items to a single molded foam part. The design of the POLYFORM® insert allowed for the elimination of various isolators, screws, nuts, washers, fixtures, clamps, molded plastic pieces, and several die-cut foam parts. Overall product noise reduced by 4 dBA. The POLYFORM® molded urethane foam part acted as a shock isolation platform for the blower motor assembly as well as an absorber for the airborne sound energy generated by the blower motor, resulting in the noise reduction. Lowered the manufactured material cost of the medical device by 12%. Elimination of the above mentioned assembly pieces helped to reduce manufacturing assembly time by over 40%. Ancillary benefits included reduced inventory, fewer part numbers, and supplier consolidation. When you take a molded solution into consideration at the start of a design project, OEMs can often design streamlined, efficient products that increase energy management, improve assembly time, and reduce the number of parts required. Molded foam can be utilized in a variety of medical devices to solve excess noise, vibration, and temperature problems. If the idea of developing a custom molded solution sounds appealing, then contact the experts at Polymer to get started in a bold new direction. (Specifications subject to change without notice. Check with factory for latest revisions.) The Federal Trade Commission considers no existing test methods or standards regarding flammability as accurate indicators of the performance of cellular plastic materials under actual fire conditions. Results of existing test methods, such as UL-94, MVSS-302, SAE J-369, and FAR 25.853 are intended only as measurements of the performance of such materials under specific controlled test conditions. Any flammability ratings shown are not intended to reflect hazards presented by these materials under actual fire conditions.